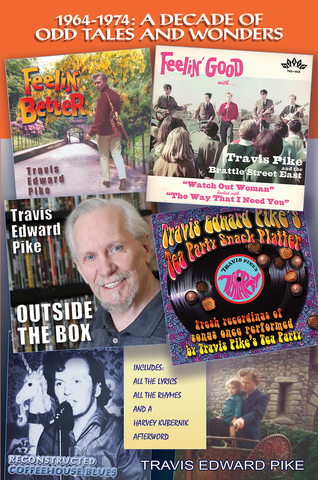 (PRLEAP.COM) Not a history, "1964-1974: A Decade of Odd Tales and Wonders" is a timely memoir of Pike's early career as a singer-songwriter during that turbulent period of our nation's history, with more than 170 photos and artifacts from those days, and complete lyrics and rhymes from the CDs shown on the new book's cover. Pike wrote the title song for the 1964 movie "Demo Derby" that played on thousands of screens across the USA with the Beatles "Hard Day's Night", at the onset of the 1960s British Invasion. 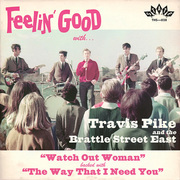 Pike also wrote ten songs, eight of which he performed on-screen for the 1966 Boston-based feature film, "Feelin' Good." The Montclairs, a racially mixed group, winners of the First Massachusetts Jaycees Battle of the Bands, performed Pike's title song on screen, but an innocuous scene of the Montclairs sharing a pizza, during that volatile period of civil rights activism, restricted the film's bookings in Southern Theaters. Following the January, 1968, Tet Offensive, that convinced CBS Evening News anchorman Walter Cronkite to speak out against continued American involvement, the Vietnam War escalated, and the numbers of American draftees rose, prompting Pike, a partially disabled Navy veteran, to write his only anti-war song, "Don't You Care at All?" As Pike writes, "… people, whether engaged or detached from the events that shape their world, are nevertheless compelled to experience the effects of their nation's histories, economically, politically, psychologically, and spiritually, and the ramifications of events in 1968 still shape our lives." In 1973, Pike provided the music theme for the 1974 Golden Globe Awards nomination for Best Documentary Film, "The Second Gun," about the 1968 assassination of Democratic Presidential Candidate, Robert Kennedy. A native of Boston, Pike's original works, performed live in coffeehouses, clubs and concert halls across New England, Northern Germany, and Southern California reflect that period. In 2016, Pike posted music sequences from "Feelin' Good" on Youtube. The "Watch Out Woman" and "Way That I Need You" sequences led to a critically acclaimed 45 rpm soundtrack recording released by State Records (U.K.), and subsequently rated number three in "Shindig!" magazine's Best of 2017 December issue. Harvey Kubernik, author of 14 music and pop culture books including this year's "The Doors Summer's Gone," published by Otherworld Cottage Industries, interviewed Pike several times over the past five years, making him uniquely qualified to write the Afterword to this book, revealing how Pike's early works now impact the present.